Nursery Singing Time can be so much fun! Using a few simple props makes singing time a blast with the littlest members of the ward. It will take a few weeks to help the kids learn the expectations (handing back the props) but they catch on so quickly. Once they get a hang of it, the props can be a really helpful tool to engage the kids in singing time and help them learn the songs. Nursery singing time is my favorite! The little ones always run up and give me hugs before I leave and it helps them be eager, and excited, when they move up as a Sunbeam! I started a blog JUST for my Primary Singing Time Ideas!! Pop over to PrimarySinging.com for even more resources, helps, and ideas! I do have affiliate links in this post. Shopping through my link earns me a small commission, at no cost to you. Be sure to read to the bottom, as I’ll be sharing how I organize all my props and activities and how I split up the songs – including a free printable Nursery singing time agenda that is so helpful for when you have a sub. But first, I want to show you all the fun songs I have incorporated into Nursery singing time in my ward! Plus, you can pop over to see my Primary Singing Time binder & organization, too! When I first got started, I began with only 10 songs “play songs” that were split across two different rotations for singing time. After a few months, we were flying through the songs and so I added more – bringing my total to 16 “play songs”, 3 reverence songs, and 1 gathering / welcome song. Don’t be afraid to start with just a few songs, and work your way up as you gather resources and props! I got the really cute singing time cards from this blog post! There were a few I added and made my own when I expanded to even more play songs. Because of the copyright, I can’t share my adaptations but a little bit of paint and clipart made it easy enough to make additional play cards for all the songs! Her printable does include a blank circle so you can make your own for whatever songs you want to include! Hello, Friends — The nursery kiddos gather around in a circle. We all hold hands and gently sway while singing this welcome song (being sure to sing “here with you in NURSERY” not Primary). This is our welcome song every week. If You’re Happy and You Know it — Jingle bells to wear on their wrist for clapping along. I also have a printed spiral with other actions and we’ll do a second verse, if we have extra time. You can grab that printable list here —> Printable Happy and You Know it Substitutions! Give Said the Little Stream — For this song we sway a ribbon sewn around a hair tie like it’s moving water. This was one of the few things handed down to me as a new chorister from a leftover old bucket in the Nursery room! The kids love these and they’d be easy enough to make, or use ribbon wands that will carry over into your Primary singing time lessons! 5 Little Ducks — Each child gets to hold a little rubber ducky while we do the song actions. I adore these ducks with numbers on them! 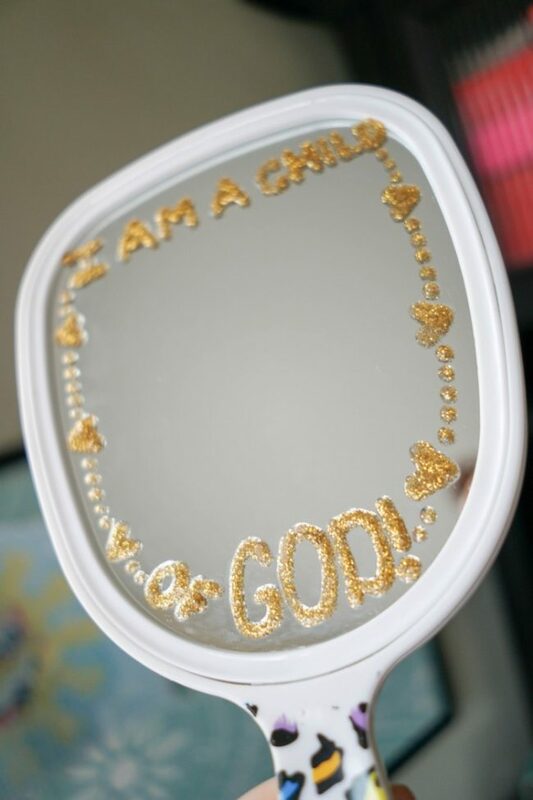 I Am a Child of God — Music leader holds the mirror and moves it around the circle lingering to let each of the children look in the mirror at their reflection. I go around the circle usually a few times. If they get silly, the mirror goes away for the rest of the song. 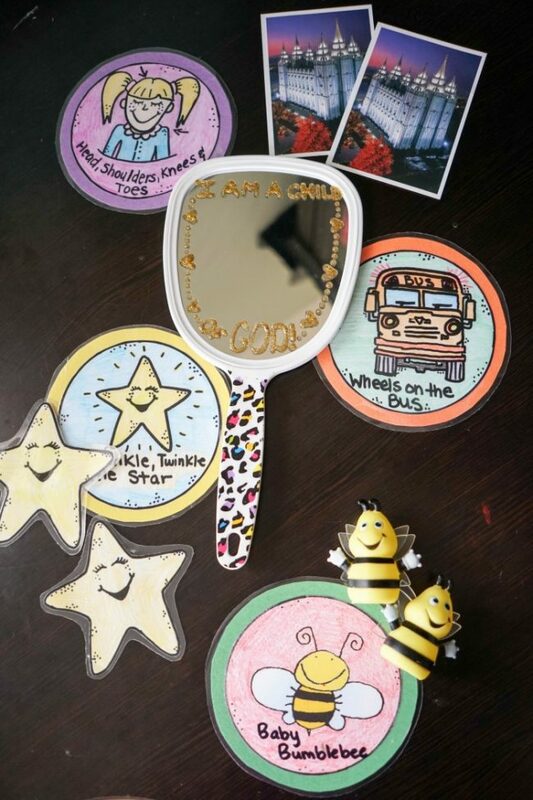 I got my mirror from the dollar store and used a gold puff paint to draw the decorations on the mirror. This is our closing song every week. Jesus Wants me for a Sunbeam — Each child gets to hold a cute sunshine on a popsicle stick! We of course do a little bounce on each “beam” word also. I Hope They Call Me on a Mission — Each child gets to hold a missionary name tag. If there’s only a couple of kids, I’ll pin the tags on them. Then, we march around the room as we sing the song together. I hot glued bulldog clips onto the backs of printed and laminated missionary name tags. Popcorn, Popping / Once There Was a Snowman — I made this card double-sided and I’ll offer the side depending on the season! We do the hand actions or standing actions for the song. Old McDonald Had a Farm — Each child gets to hold a little bendable farm animal! There are only 3 varieties, which keeps this song nice and short (cow, horse, pig). Itsy Bitsy Spider — This song is everyone’s favorite! I printed out cute little spiders and hot glued a black fuzzy puff ball and wiggly eyes on top. The kids love them! Do as I’m Doing — Each child gets to hold an egg shaker. Sometimes we’ll make a little pattern (think left to right, or up and down, or even a tap on the knee) for them to follow along with. Every week we start with Hello, Friends then our faith song of the month (I Love to See the Temple or Jesus Wants Me for a Sunbeam). 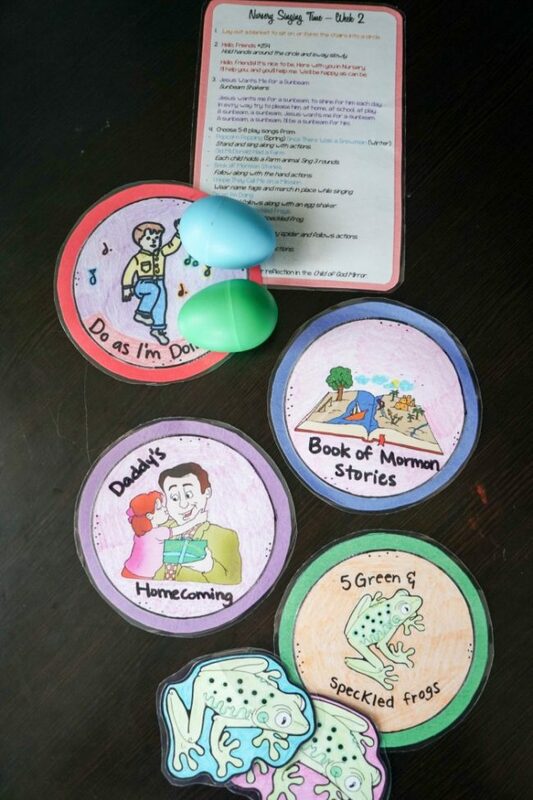 Next, I’ll hold out 3-4 of our play song circle cards and let a child pick which play song we’ll sing next. They love being “helpers” and getting to choose the song. I then pass out the props, then the kids are really good about handing them back in to me. After we make it through all (or most of the play songs if we’re short on time) we’ll close with I Am a Child of God. 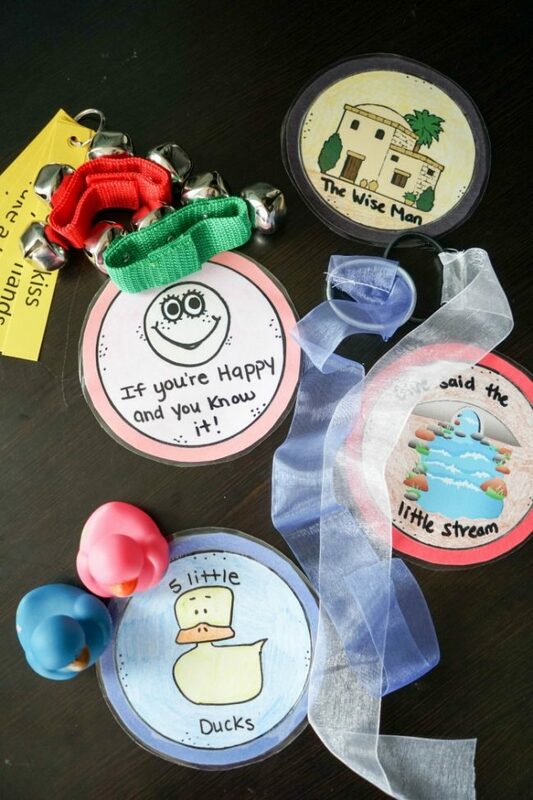 I’ve tried a few different ways to organize all the props for Nursery Singing Time, and most weren’t great. I started with a large ziploc bag, that was always ripping at the side seam by the zipper. It was also difficult to easily grab the props. Next, I moved to a clear plastic tote. Again, there wasn’t any organizational pockets to keep things separate so it took some time getting to each prop. I finally found something that I love to use for Nursery Singing Time for holding all my props! 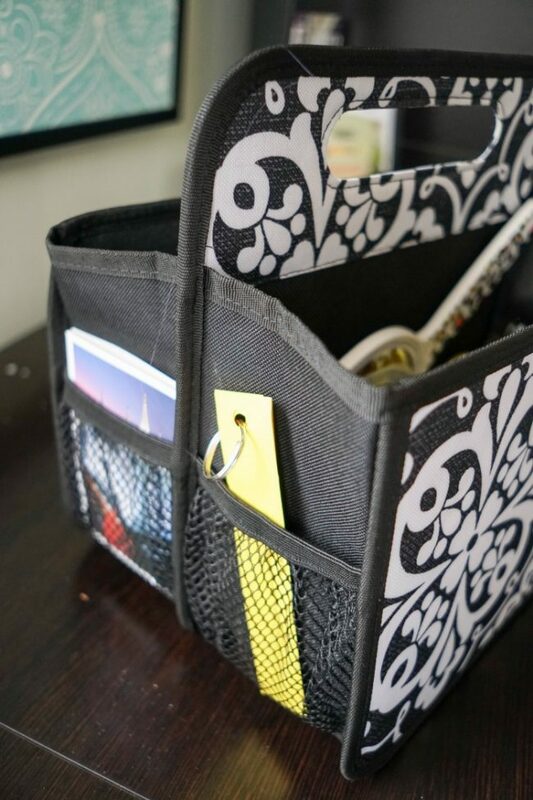 I got mine from Thirty-One Gifts, but I’m sure you could scope around to find similar options in stores. It’s called the “Double Duty Caddy” if you’re going to try to hunt it down. I found one on Amazon, that will save you the separate shipping if you have Prime! The key for me was two large divided main pockets and then side 4 side cubbies on each end. I use the side pockets for my printed and laminated props – like the temple cards, frogs, and stars. I used to use a printable bumblebees as well, before I found those irresistibly cute finger puppets and made the switch. The large divided pockets I use for my instruments and props. 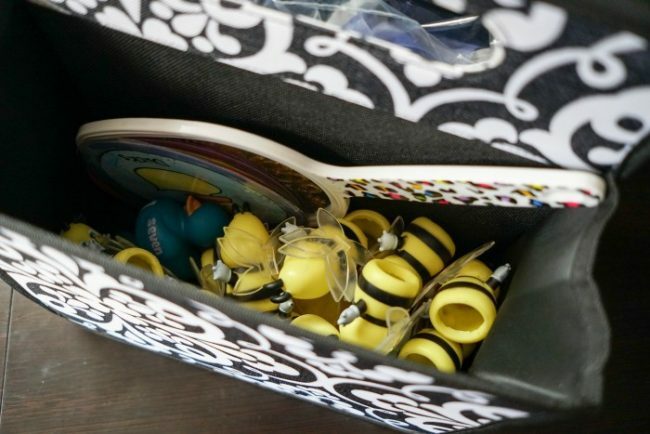 For the first month props that includes: bees, bells, ribbon wands (stored in a ziploc bag), and rubber ducks. My mirror and play song cards also go in the large pocket. 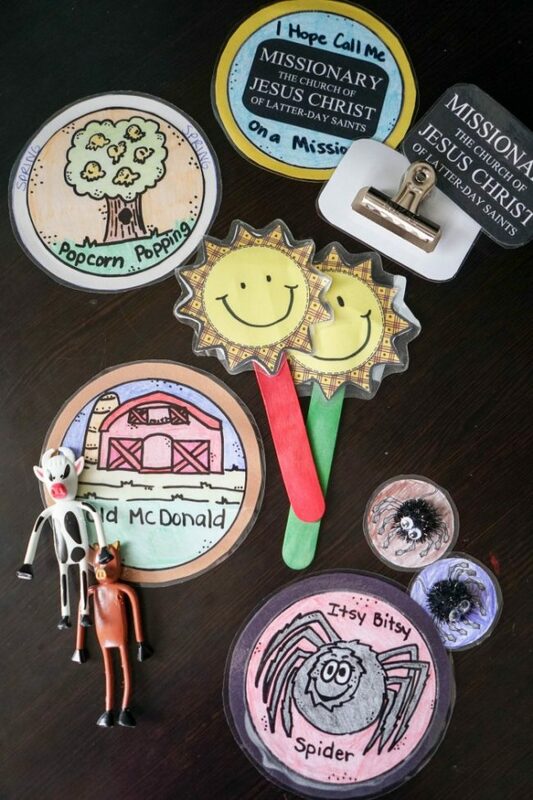 For week 2, those props include: egg shakers, missionary tags (stored in a ziploc bag), bendable farm animals, and itsy bitsy spiders (stored in a ziploc bag) plus my sunbeam sticks. I rotate my bucket once a month – singing the same songs throughout the whole month. If you have a place to stash your singing time supplies in the Nursery room, you can easily leave your supplies there and pull them out just for Singing Time! Then, each month I’ll switch to the next song list. I keep a printed and laminated song list card inside each of my buckets. 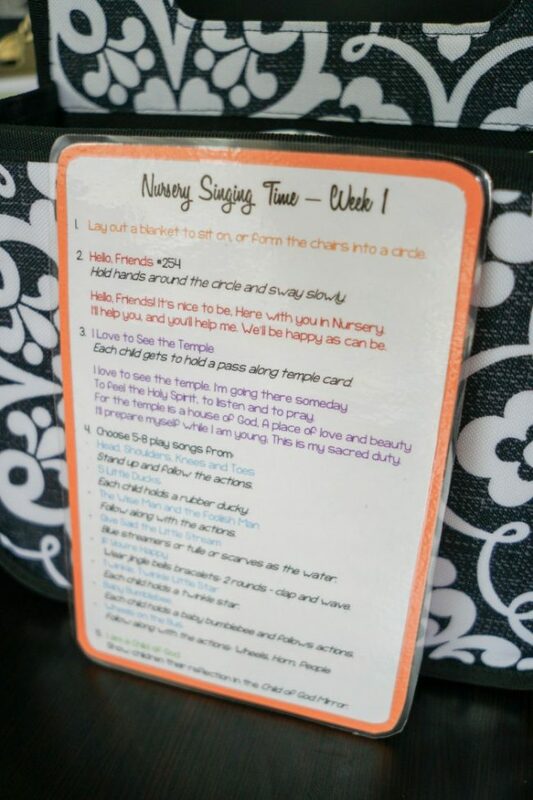 It has directions on the order for Nursery Singing Time and helps for a sub with what actions / props to use. You can download a copy of my Nursery Song Schedule. You’ll be able to edit the schedule to make it unique fit your needs. To have the document properly formatted, I used two free fonts: KG Payphone font and Strawberry Blossom font. You can download and install those or just plan to adjust the fonts so the list fits across two columns on a single page! Then, just print, cut in half, layer a piece of construction paper or cardstock for color and laminate! Head over to see my Primary Singing Time Binder and organization, next! What are your favorite songs to use for Nursery Singing Time? Previous Post: « Washabelle: First Ever Washable Mattress for Kids! I love these ideas. My kids used to love it when I sang to/with them. Making it more interactive is always a great angle to take! My daughter loved nursery rhymes when she was a baby. This is such a fun idea! Love this! What a great way to organize all of it too! I think my favorite is Wheels on the Bus although you gave so many great ideas it’s hard to say just one favorite. What wonderful ideas to make nursery even more wonderful for the children. I need to look up all of those songs. Some I’m not familiar with. What a fun idea. I loved singing with my kids when they were little and even teaching them simple songs on the piano. Great props too!